The seventh beta version of OS X Yosemite 10.10.3 mac operating system has been officially seeded by Apple. 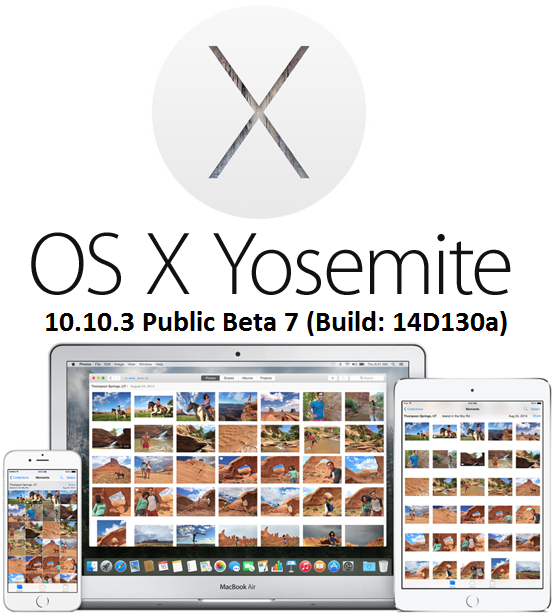 The latest released of OS X Yosemite 10.10.3 Beta 7 (Build: 14D130a) Update is available for all OS X developers and non-developers (general users) instantly, because it’s also a Public Beta Version. The previous two public beta versions were OS X 10.10.3 Beta 6 (14D127a) and OS X 10.10.3 Beta 5 (14D113c) respectively. The Direct Download Links of OS X Yosemite 10.10.3 Beta 7 Combo and Delta Update .DMG Files are available. The official release notes of OS X Yosemite 10.10.3 Public Beta 7 (14D130a) contains several new functionality changes such as; Bugs, stability, performance and security fixes, support of force touch, inclusion of photo app, new emojis, improvements for screen sharing, Wi-Fi captive networks, Mail, Safari, Hebrew and Arabic system languages etc. How to Install OS X 10.10.3 Beta 7? Go to Mac App Store >> Software Update option, to get Mac OS X 10.10.3 Beta 7 Update automatically. If you're OS X developer, then visit OS X Dev Center website for official OS X 10.10.3 Beta 7 Downloads. If you're non-developer, then manually install and activate OS X 10.10.3 Beta 7 via iTunes without registered UDID developer account for Free. 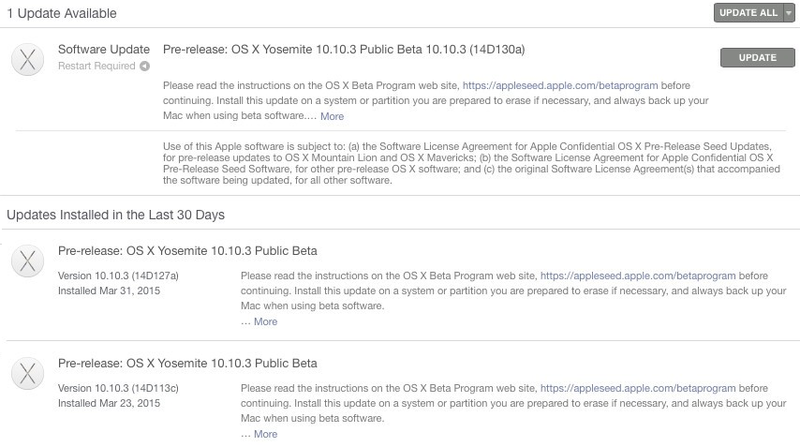 Download OS X 10.10.3 Beta 7 Delta and Combo Update .DMG Files via Direct Links below.